Back in November I was strolling through Instagram before Sunday lunch, when I came across these brushes on Debra Bow’s account. When I read they was under £10 and from eBay I couldn’t stop myself from ordering them right there and then. I’m a terrible impulse buyer, this year I’m trying to save money so that’s definitely something I want to work on! If I can remember correctly they took what seemed like forever to arrive, I think it was two weeks or close to it! When I opened the padded envelope it was love at first sight. They are absolutely gorgeous to look at. They felt very soft. I went for the 7 piece set which included 4 face brushes and 3 eyeshadow brushes. They cost me around £8.00. I wanted to test these with different products and wash them so I could give you an honest review. 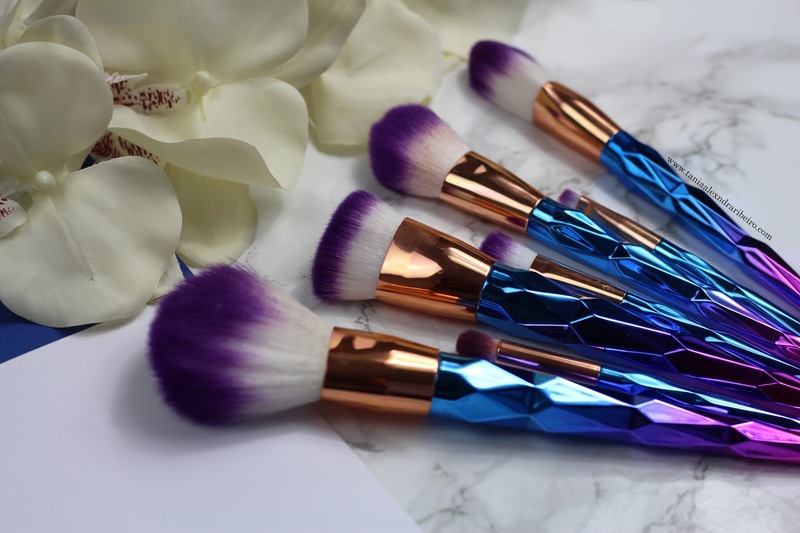 It’s a very stunning set of brushes and sure to catch anyone’s eye sitting on your dressing table. They are very light in weight, and feel slightly cheap. Which I guess they are! I always worry when brushes feel ‘too soft’ I find they don’t do their jobs well. 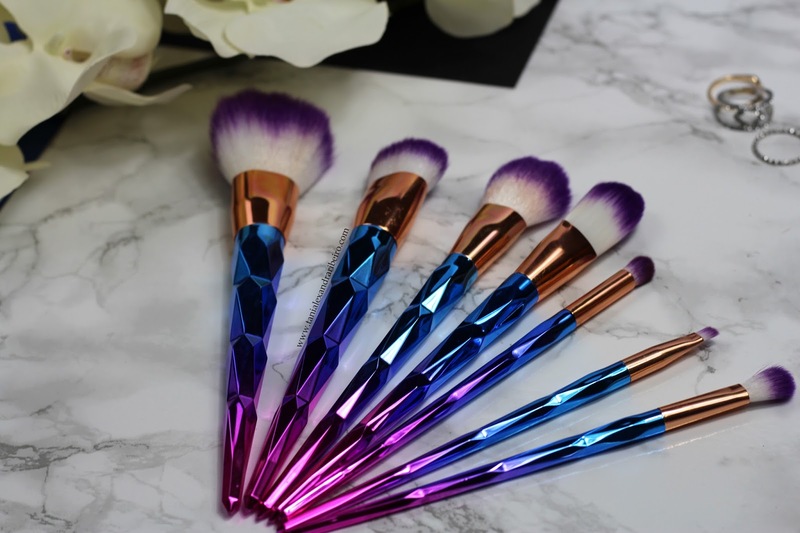 I’ll start with my favourite brushes which are the eye ones, I find they do a good job and pack the colour and blend very well. I don’t use the foundation brush, as I prefer a different style. I find your classic foundation brush gives you a very cakey finish in general. The powder and blusher brush I don’t like I’ve tried it a few times and they have always felt like they weren’t doing anything they are too soft if that makes sense. They wash well with minimal shredding on the first wash. I don’t know if you can see but two of the brushes have stains from products I tried my best to try get them clean without damaging them. Overall I think this is a great starter set for anyone, or makes a great gift. They look very pretty in a brush holder next to my spectrum ones! I do love an eBay bargain. Have you got any eBay makeup bargains? Your welcome, i love your work! These are so pretty, I'm not surprised you were straight on eBay with them being under £10! I would totally get them if I didn't have way too many brushes already! These are beautiful - can't believe they were such a bargain! Do they come in other colours? These are stunning. Falling in love with them. Must resist. I wonder if they are cruelty free or not! They're absolutely gorgeous. What a bargain too! Great honest review! these are a perfect blog prob, even if they don't all work great, I guess for £8 you don't mind! I bought them because of Bow too! I've yet to use them yet, probably because they just look so pretty! These are lovely. Although seeing all this unicorn stuff about makes me wonder what people will do with it all when it goes out of fashion! They look gorgeous! I think instead of actually using these I'd just use them as props for blog photos as they are too pretty to use!